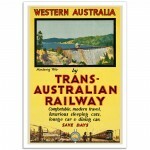 South Australian Railways (SAR) was the administrative corporation through which the State Government built and operated railways in South Australia from 1854 until. 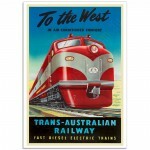 South Australia lays claim that it is one of the few places in the world, that has three major rail gauges (1600, 1435 and 1067 mm), in addition to other uncommon gauges. 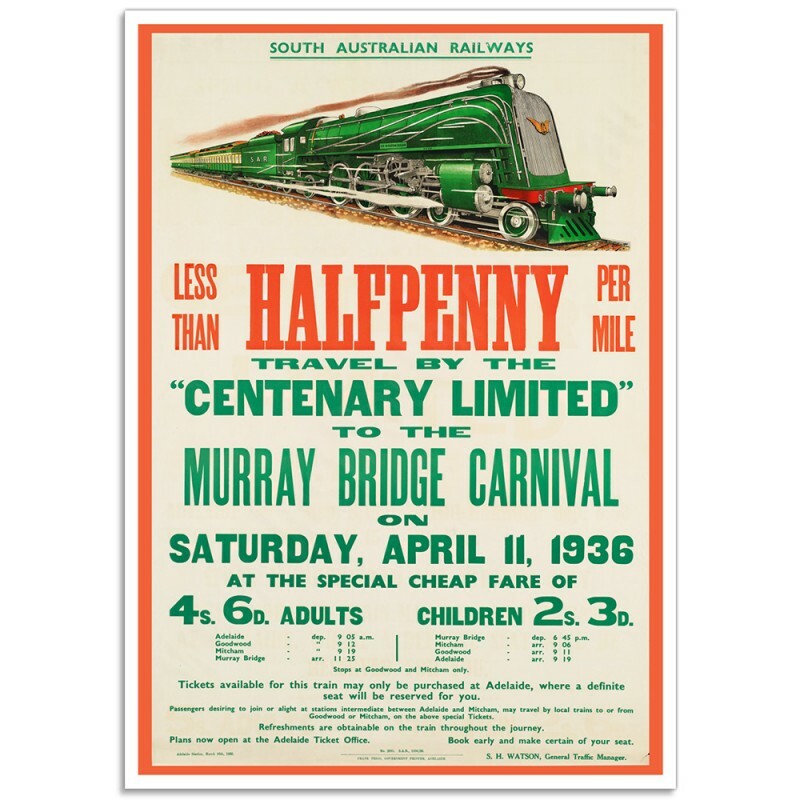 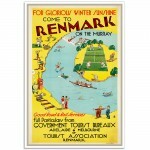 This 1936 advertising poster promotes a special service to “The Murray Bridge Carnival” on a 620 class steam locomotive. 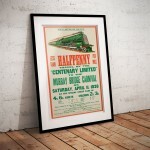 The Sir Winston Dugan, illustrated here, was the first streamlined broad gauge 620 class locomotive built at the Islington Workshops in South Australia and was decorated in green and silver. 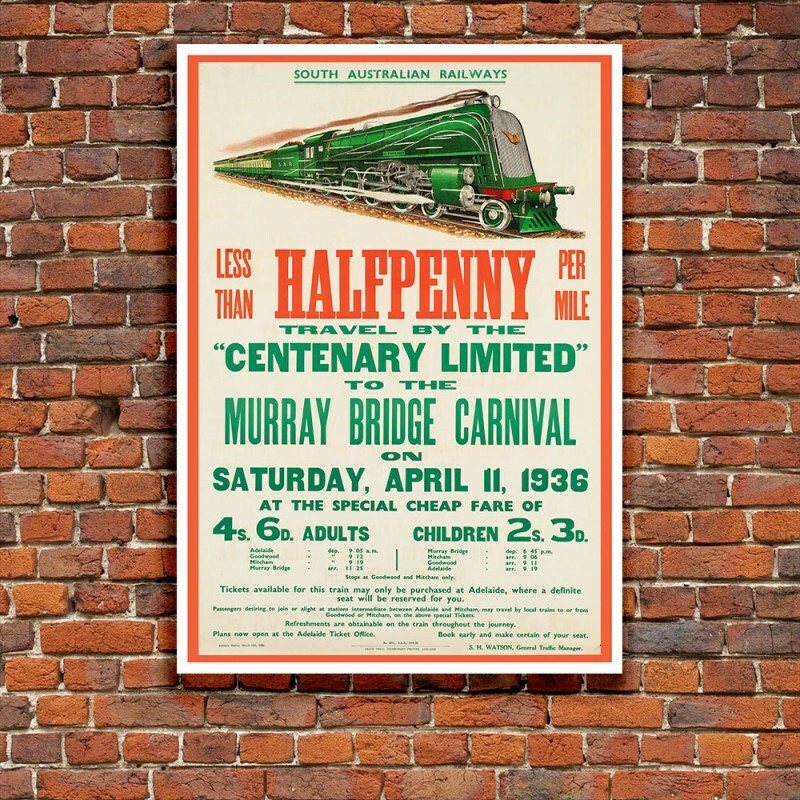 It was used as the engine for the Centenary Train which visited sidings and stations around the state during the Centenary of the State in 1936. 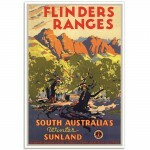 It was named after Sir Winston Dugan the Governor of South Australia appointed in 1934. 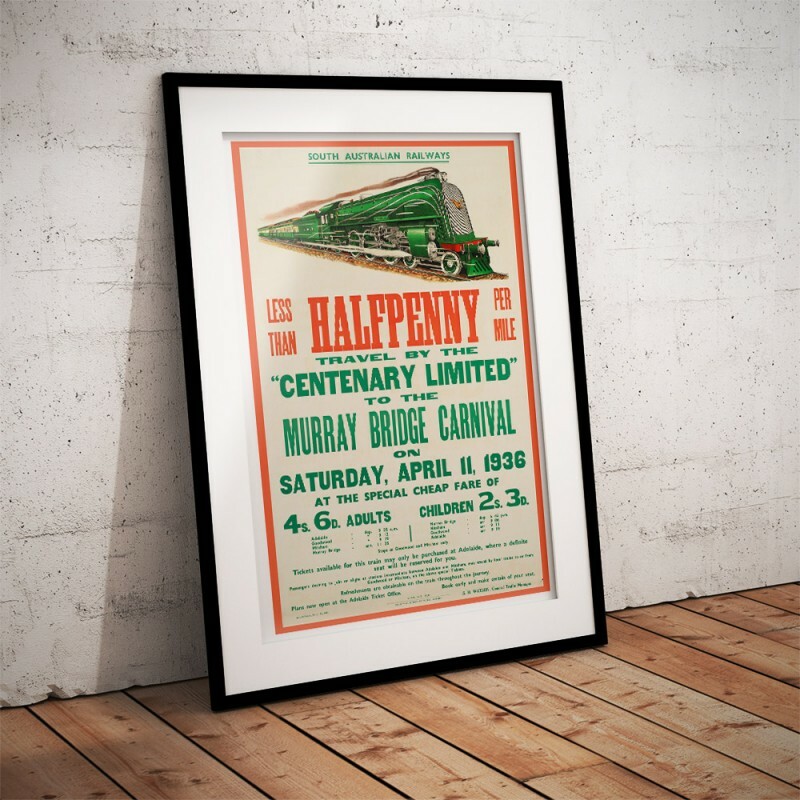 A 4hr. 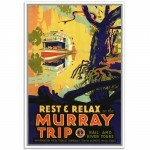 80min journey; Departing Adelaide 6:45am – Arriving Murray Bridge 11:25am. 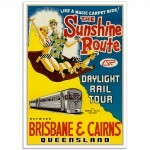 These day the 75 kilometre trip takes 55min by car, but not nearly as much fun.. 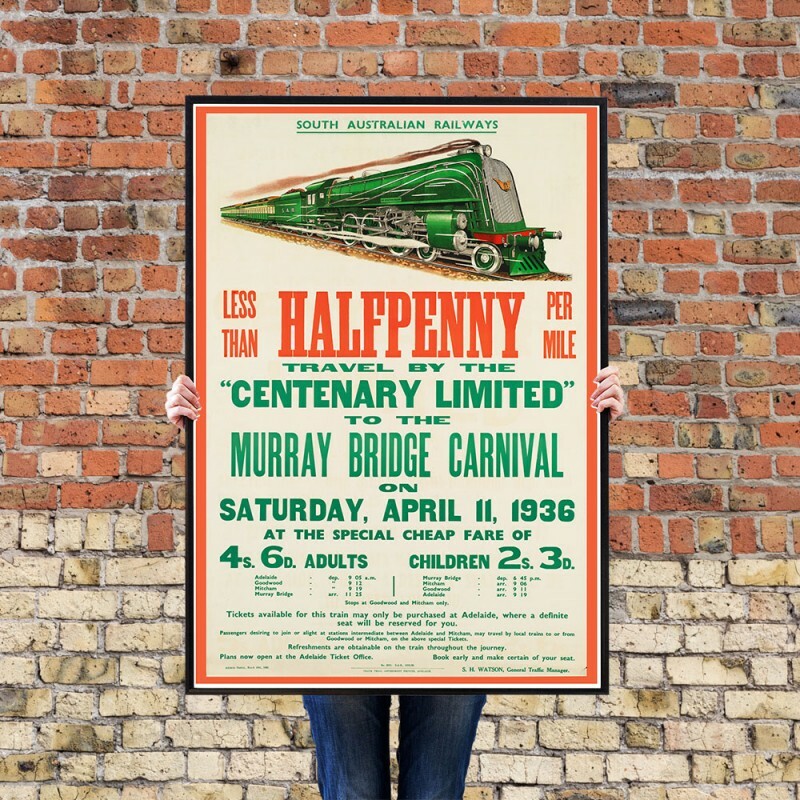 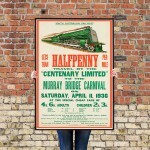 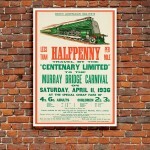 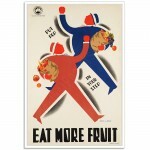 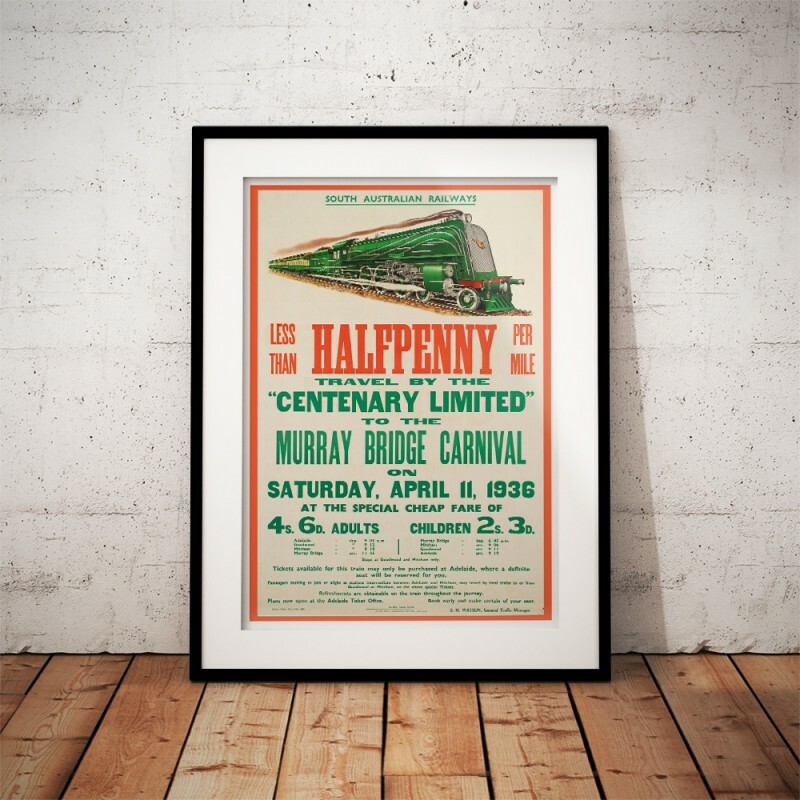 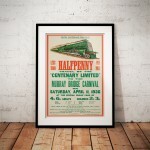 The 'SA-Railways - Murray Bridge Carnival' Poster has been created from an original poster. 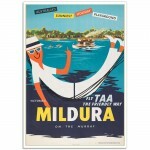 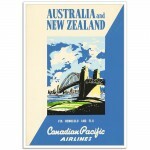 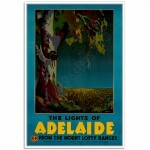 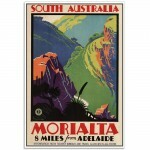 WA-Trans Australian Railway - Vintage Australian Railway Poster'Western Australia by Trans-Australia..
To The West - Trans-Australian Railway - Australian Railway Poster"To the West in Air-Conditioned Co..
Mildura on the Murray - Retro Australian Airline Poster.Fly the Friendly Way.The artwork for the ori..